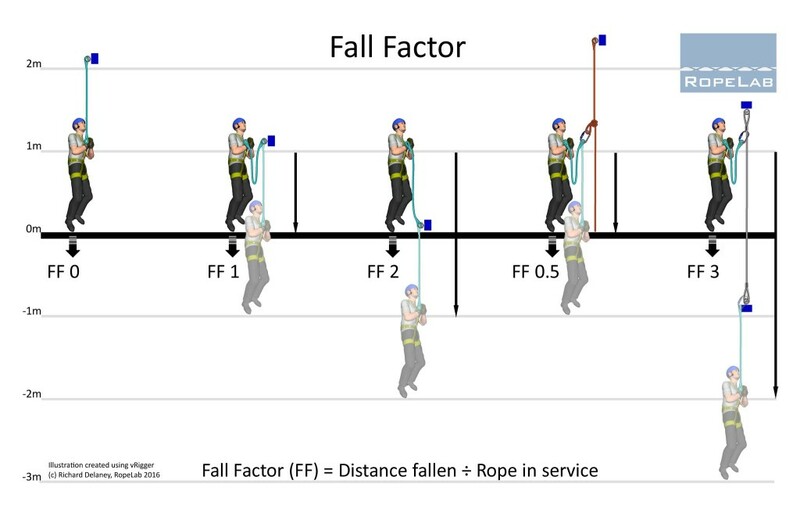 The term ‘Fall Factor’ (FF) is often used to describe the ratio of the distance fallen to the amount of rope in the system that is available to absorb the energy associated with arresting the fall. This term probably originated from rock-climbing and an effort to describe the relative severity of the impact felt by the leader during a fall. It is now used by many rope technicians, but we must remember that it is only an approximate indicator and it is often incorrectly applied when attaching to other non-rigid systems. The 1m lanyard is tight to an overhead anchor thus no fall is possible and this is effectively FF0. The ends of the lanyard are attached to the harness and an anchor at the same height. The operator can fall 1m on a 1m lanyard so this is FF1. Now the 1m lanyard is anchored down at foot level and thus a 2m fall is possible. This is FF2. This time the 1m lanyard is attached to separate rope which runs another 1m straight up to an overhead anchor. Now there are 2m of rope in the system to absorb the impact of the 1m fall so this becomes FF0.5. This final situation is unusual but sees the lanyard clipped to a vertical cable. Now the operator can fall 3m on their 1m lanyard which gives FF3. This would be a very dangerous fall. Places where there are multiple strands of rope, such as the bight of the knot attached to the anchor sharing the force of impact. Flex and movement of static elements within the system. Friction between the rope and any intermediate connectors. Thus, FF is usually expressed in simple ratios like FF2, FF1, FF0.5, and perhaps FF0.2.